From SR88 hike through upper Willow Springs Canyon following an old jeep road over to Bagley Tank. Return by the same route or make up your own off trail loop back to the trailhead. 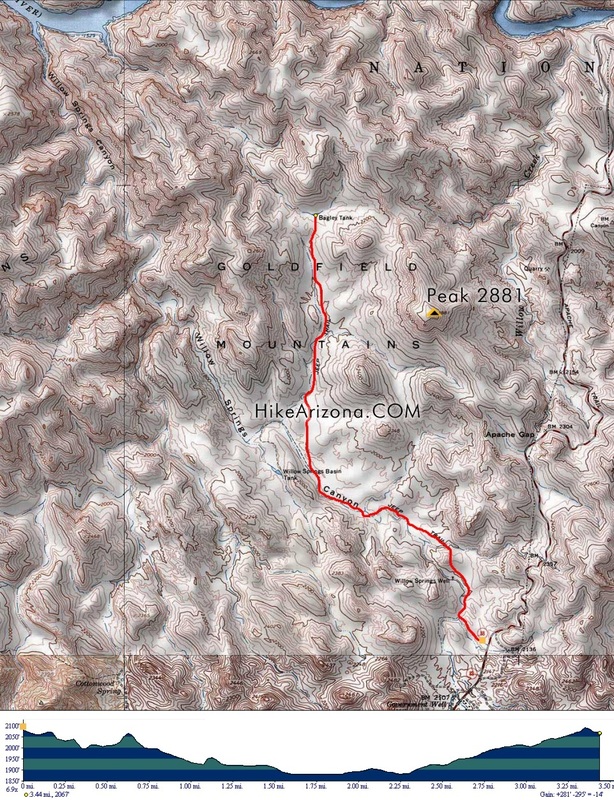 I wondered what was north of the Apache Trail having driven by many times. I looked up the Goldfield Mountains on the computer and found a great deal of information about the area. For example there are very few actual trails and only some jeep trails to follow. Most of the great scenery is off trail. There are many natural arches in the area but all have to be reached by off trail hikes. I selected the Willow Springs Trailhead. As a reference point, Needle Vista viewpoint is on the south side of the highway. The trailhead is not marked but it's a clear pulloff area just before mile marker 204. A locked iron fence blocks the road from vehicle use (maybe by permission but we are hikers) and once through it the jeep trail winds down into the Canyon to Willow Springs Well that looks to be quite deep with a cement frame around it. Our objective was Bagley Tank which is roughly 3.5 miles from the highway. We found some caves, pipe lashings, cement troughs and lots of evidence of years ago cattle areas.There also were many "waterholes" with lots of water. The dogs loved that. Much of the roadbed is sand and it makes for difficult walking. You pass some nice meadows and a grave with a beautiful cross. We wondered who and what and how. Once we left the creek bed-road bed we began to climb slightly more northerly toward the Bagley Tank. Once we arrived we were quite amazed at all the work that had once gone into that water catch. Some of my photos show how big a catch basin it is and how the berms have been built up around it with inlet and outlet trenches. So this is a "tank" out here! Interesting. The terrain up and back is quite beautiful and really quite different from the stark, jagged Superstition range nearby. Even the color is varied in the cliffs and surface rocks. We went beyond the Bagley tank a few hundred yards and had a great lunch in a canyon. Although a bit rocky in places this is a fairly easy hike (except for the sand sections like walking on a beach). It opened me up to the Goldfield Mountains. Now I've arranged to go see some of the arches in the area. Over 10 have been identified but all are off trail. It was a good day. A bit windy, however the temperatures were great! There was 4 of us and 2 dogs. Great fun for me as I did not have the fear of heavy steep climbing. Now I've discovered a new area nearby my home with some interesting terrain.